Opens first franchised outlet in Guntur. Me n Moms has launched its first franchise store in the country. Located in Guntur, the store is spread across 1,000 sq. 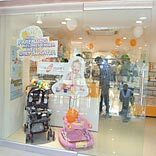 ft, and exhibits a dedicated range of kids' wear and accessories under seven categories along with maternity care products for pre-natal and post-natal care. The store aims to become a ‘one-stop destination’ for both mothers and their children. The company currently has a turnover of Rs 80 crore and aims to reach the Rs 300 crore mark within the next five years. It currently operates 12 exclusive stores in India.